Kerala PSC Lower Division Clerk (LD Clerk/LDC) examination conducted by Kerala public service commission on 2017 in all the districts of Kerala. KPSC will be publishing the rank list / shortlist / probability list for Kerala PSC LDC in December 2017 or January 2018. The short list will be available for the candidates on all the district offices of Kerala PSC. The Kerala LDC Exam 2017 was conducted all districts on June, July and August in 2017. There are about 25,000 candidates will be included in the LD Clerk short list 2017. 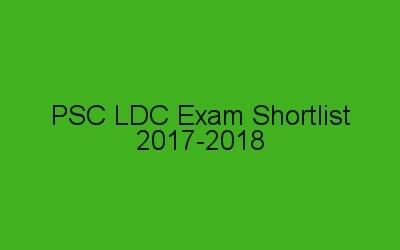 The candidates in this LDC probability list will be called for certificate verification. After the certificate verification these candidate will be considered for the main rank list. Kerala PSC LDC Probability List 2018 / ShortList will be provided by PSC official website www.keralapsc.gov.in.The Probability List prepared on the basis of marks scored by candidates in the written exam conducted by Kerala PSC. The Supplementary Rank list prepared by Kerala PSC will have about 2.5 times candidates of the main short list of lower division clerk. Kerala PCS will also publish a rank list for the candidates who are transferring from Last Grade posts. A total of 1 lakhs candidates will be included in different types of rank lists that the public service commission is going to publish. The candidates who have secured 76.33 marks and bove are included in the Main List of the Probability List.